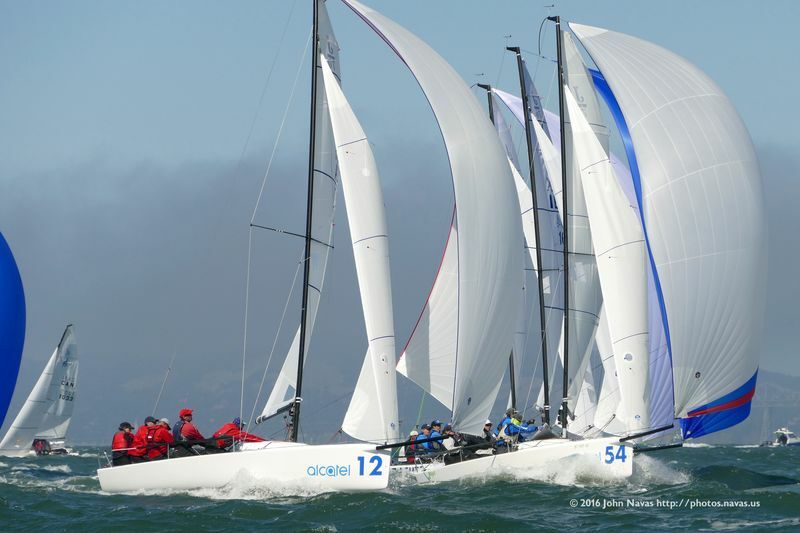 With an hour postponement at the harbor, racers were anxious to get the first race going at the Alcatel J70 World Championships. Race 1 moved to 12:00 start with a building breeze. The wind was from 230 at 12-14 knots with a slight build of ebb tide. We were thinking a wild and windy day was ahead. After 2 general recalls, the RC hosted the black flag start which kept all but 12 boats behind the line. Those 12 boats unfortunately were disqualified and scored a max 69 points. Oops, not a good way to start the regatta. On USA 250 “Nunuhunu” we started 2nd to 3rd row with a couple of tacks immediately after the start to get clear air. The only problem, we were heading to the right, not the left as we planned. Coming into the weather mark in the 40-50 slot is very crowded. There was yelling and rude gestures between many boats. Spinnaker handling became a big gainer or loss as the boats popped up on a plane. USA250 had super spinnaker work and played thru some of the traffic and trouble. 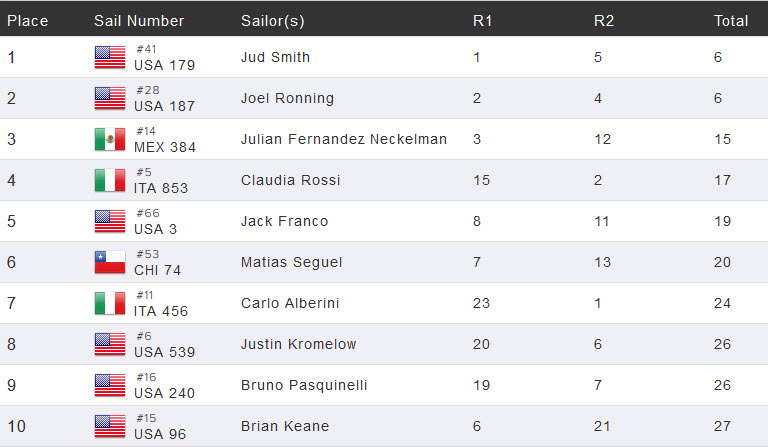 We finished 32nd with some needed upwind work and lane management to work on for race 2. Mike Radziejowski, our local expert and U/S Santa Cruz person, picked wanted our start tactic to work left side to take advantage of building ebb tide. Our start was ok, with a rounding 42nd and then the fun began. The wind was puffing over 25 knots with carnage every where. USA 250 sailed perfectly downwind with gainers on both sides. We gated left and passed some boats who gated right. The bottom of the course was showing lulls and pockets of confused air. We tacked out for better wind and passed some more boats. Rounding the last upwind mark we played the right downwind lane and waited for the gone to “send” it” on the port gybe to the finish. It worked well passing 3-4 more boats. – start well and keep the BFP off the score sheet. – easing the jib out a tiny bit in the big breeze makes steering easier against the chop and lets the main trim a little more relaxed. – keep having fun. Nice day “at the office” on San Francisco Bay!